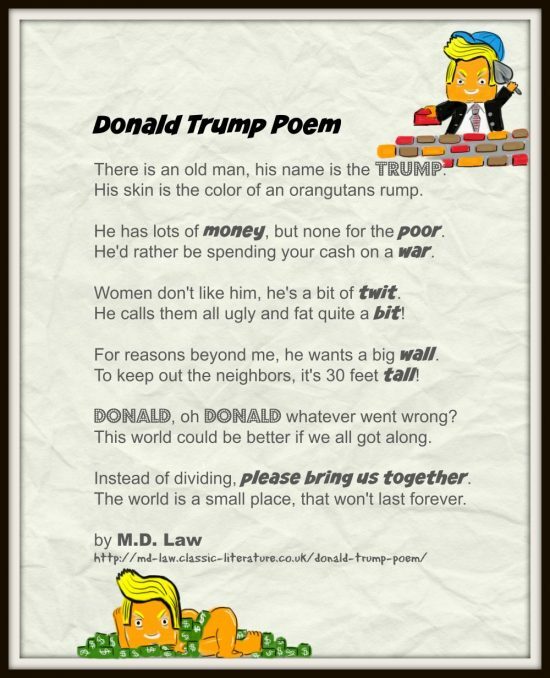 We wrote a short Donald Trump Poem. There is an old man, his name is the Trump. His skin is the color of an orangutans rump. He has lots of money, but none for the poor. He’d rather be spending your cash on a war. Women don’t like him, he’s a bit of twit. He calls them all ugly and fat quite a bit! For reasons beyond me, he wants a big wall. To keep out the neighbors, it’s 30 feet tall! Donald, oh Donald whatever went wrong? This world could be better if we all got along. Instead of dividing, please bring us together. The world is a small place, that won’t last forever.